Imagine the following scenario: You are walking around in your house barefoot. While crossing one of your carpets, you step on something. You lift up your foot and what do you know - a squashed ladybug. Poor little thing. What if it isn’t actually a ladybug, but rather a carpet beetle? If you have experienced this situation and now want to flee your home, put down your suitcase and continue reading. How Do You Know if You Have Carpet Beetles? How Do You Get Carpet Beetles And Where To Find Them? How Can You Get Rid Of Carpet Beetles FAST? How Can You Prevent a Carpet Beetle Infestation? 2. Check flowers before your bring them to your home. 3. Make sure to keep doors and windows closed. 4. Remove birds’ and animals’ nests from your garden. 5. Disinfect your rubbish bin on a regular basis. 7. Clean your carpets frequently. We share helpful information on how to get rid of carpet beetles, where you can find them, and of course - how to prevent an infestation. ​What do Carpet Beetles Look Like? ​This type of bug is small in size - about 0.3-0.5cm. It has a round light brown shell, which is speckled with black and white spots, and owns 8 legs​​​​. The furniture carpet beetle highly resembles the varied one, which is why many people get them mixed up. ​The varied carpet beetle is only 0.25cm, making it the smallest example of the carpet beetle family. It has a slightly rounded shell in a blackish colour with white splatters. The varied carpet beetle has only 6 legs. This type of carpet beetle is huge in size compared to the rest of the family members - it can reach about 1 cm in length. It also has a specific shape, which makes it easy to distinguish from the rest of its cousin carpet beetles. As the name states, its shell is a solid black colour. It has 6 legs and 2 highly visible antennas. ​As the name suggests, carpet beetles mainly munch on wool carpets. “Nowadays, infestations have dropped a lot, due to the fact that most rugs are made from synthetic fibres, which the bugs can’t eat. In the summer, these insects seem to migrate to cooler areas,” ​says Alexander Crawley, a professional pest exterminator at Fantastic Pest Control (Australia). ​This particular species is Endopterygota (also known as Holometabola), which means it experiences absolute metamorphosis - from egg to larvae, then to pupae and finally, adulthood. Black and varied carpet beetles give birth to just one generation, while other species can produce multiple. Lifespan varies a lot too. Some carpet beetles live up to three months while others can prosper for years. ​Usually, carpet beetles mate during the summer, lay eggs and die right after that. Their lifespan depends on the amount of food it gets while in the larvae stage. ​Adult beetles near windows. An interesting fact is that adult carpet beetles don’t do much damage - their larvae are the ones to blame. Carpet beetles mainly eat pollen and can be spotted in the warmer months around your windows, desperately trying to get out. If you discover a tiny beetle near that area in the spring or summer months, without a shadow of a doubt, you have a carpet beetle infestation. ​Concentrated damage. As we discussed earlier, fully-grown carpet beetles won’t do much harm. The real enemy is their offsprings. Larvae tend to feed in dark corners or under heavy furniture, like your living room sofa, for example. Unlike other types of insects that consume organic materials, the moth for instance, carpet beetle larvae eat in concentrated areas. So, if one day you find your favourite shirt, looking like swiss cheese, you probably have a carpet beetle infestation happening right in your closet. ​Left-behind larvae skin. 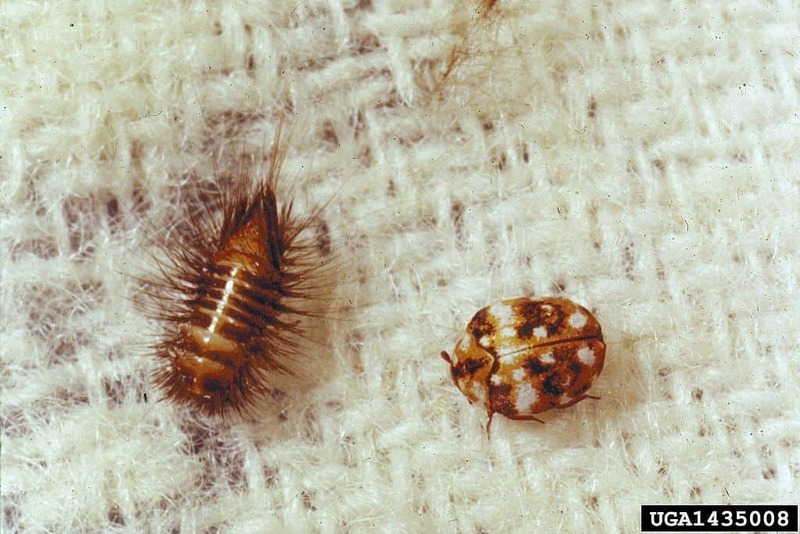 Carpet beetle larvae change their skin several times during their nine-month lifecycle. This process is called moulting. Look around your home for signs bugs shedding. Inspect your carpet, the bottom of the wardrobe, or underneath your sofa. If you spot a pile of furry shed skin, congratulations - you are a proud owner of a carpet beetle colony. ​Shy baby beetles coming out to play. Carpet beetle larvae are generally on the shy side when it comes to behaviour, which makes them hard to spot. If you want to lure them out, close the curtains or shut your blinds during the day. Before you know it, you’ll see a small army of beetle babies, marching on the walls or around the dark corners of your property. ​Faecal pallets. Like every other living thing, carpet beetles poop. Their droppings are brown to black in colour just like our pets and about the size of a grind of sand. You can find them scattered throughout areas, where carpet beetles tend to feed most often - around the bottom of your closet, on your favourite sweater, or on the floor. ​We've put together a comprehensive review, where we found the best companion for all your cleaning needs. ​Carpet beetles are not the brightest representative of the Coleoptera family and that’s why they won’t have much trouble while moving into your home undetected. These evil masterminds are known to travel by plant, meaning you can invite them to your house by simply bringing a rose pot to your home. They also like to use animals as a way to migrate, so don’t be surprised to hear that your cat or dog may have brought an infestation inside. Carpet beetles can enter your property through chimneys, your plumbing system, vents, and even electrical conduits, too. In other words, this sort of insect has a wide range of options, in which it can invade your home, so it's important to maintain the cleanliness of the ​house if you want to keep these carpet beetles at bay. ​Once carpet battles have found their way into your house, they can infest practically anything - from a woolly sweater to a box of pasta. The idea is that the bugs live near the food source, which can be your kitchen.. So, take a closer look inside your pantry, inspect the rugs and carpets, and don’t forget to inspect within your closet too. If you’ve covered all the listed areas, but still can’t locate the evil-doers, just to be sure, we advise you to get a professional pest technician to inspect your property one more time. ​Find the carpet beetles. Look in the above-mentioned areas - underneath your furniture, in dark corners, inside the pantry, on the carpets, and where you store your clothes. ​Vacuum the infested area. First, clean the areas, where the carpet beetles are located at, and then, ​t​he rest of your home. Do ​​​his once a day until the infestation is completely gone. ​Sprinkle Boric acid powder on your carpet. Wait about two hours, and then vacuum. This way you’ll kill not only the carpet beetles, but their eggs and larvae, as well. ​Throw away infested clothes. No matter how much you love that cozy sweatshirt, if it has holes, get rid of it. Carpet beetles have the tendency to hide their eggs within the fabric of clothes. So, if you don’t throw away the damaged items, you risk restarting the infestation. ​Put everything in the washing machine. Gather your clothes, towels, bedding, even the curtains and wash them on a high temperature to kill any left carpet beetles. Clean your carpets with hot water and shampoo or steam clean them. These insects are vulnerable to heat but if not sufficient, your effort might end in vein. Get rid of any food that the carpet beetles came into contact with.​ Otherwise, you risk eggs to stay behind and reinfest again. Install special insect traps around the infested areas. Do this even after you are done with the cleaning, in order to lure out any bugs that have survived. Buy synthetic sheets and carpets, instead of natural fabric ones.This way, you’ll cut off one of the carpet beetles’ main food sources. ​Put all clothes made from natural materials, especially those you don’t wear that frequently, in plastic bags. ​Make sure to expose occasionally items, especially those you store in your closet, to direct sunlight. This will make any hidden carpet beetles crawl out. ​Clean your entire home on a regular basis to reduce the chances of an infestation. ​Like we said in the article, carpet beetles can get inside your home by hitchhiking on plants. So, before you decide to bring your favourite flowers inside, inspect them carefully for carpet beetles. The same goes for plants you picked from your garden. ​Carpet beetles can fly, so if you leave windows and doors open for an extensive amount of time, you are practically inviting these creatures in. Small holes and damaged walls can also cause problems. Make sure to seal all, and thus prevent bugs from entering. ​If you happen to have a bird’s nest located on a tree near your house, make sure to remove it as fast as possible. Carpet beetles are most-known to inhabit the homes of birds and other types of animals. ​After you take out your rubbish, make sure to disinfect the actual bin with antibacterial wipes. Thoroughly clean the container every 6 months with bleach, diluted in water or some other cleaning chemical..
​Since carpet beetles don’t favour having polyester for dinner, invest in carpets, rugs, sheets, and furniture made from synthetic materials whenever possible. ​Vacuum all your carpets and rugs at least once a week. Combine that with regular steam cleaning treatments and eliminate the source of food for larvae - hair, lint, and dead insects. If you don’t have a steam cleaner, you can always hire professionals to treat carpeted areas for you. Carpet beetles aren’t known to bite humans, but can leave your skin with a nasty rash. Still, while they can't affect your health negatively, carpet beetles are capable of inflicting some serious damage to your possessions. What kind of damage do carpet beetles cause? 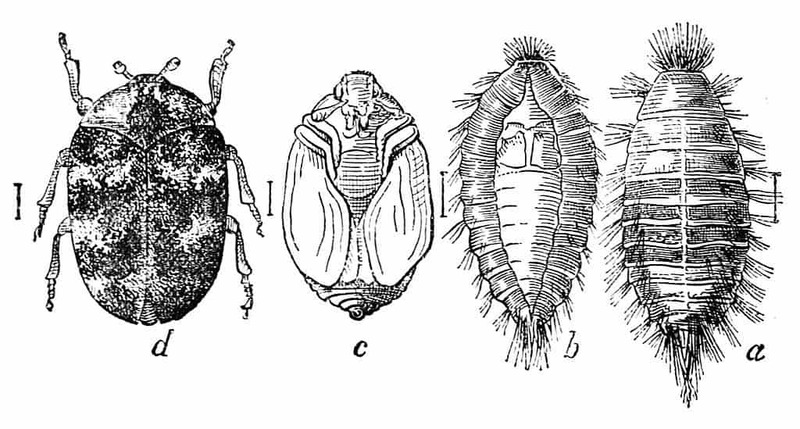 Apart from destroying your carpets and rugs, carpet beetle babies can also attack anything made from wool, silk and fur, food grains, and even your spice rack. Adults prefer a diet made mainly from pollen and nectar. Can the insect trigger allergic reactions? Yes, carpet beetle skin and hairs are known to cause irritations like skin rashes. You have to physically get rid of the bugs in order to stop the allergy. Medicaments can help only to a certain level, but won’t fix the overall problem. Yes, carpet beetles are able to fly, but only the adult ones. Younger insects and larvae can’t. Will the infestation go away in the winter? Sorry to be the bearer of bad news, but the carpet beetles will stay inside your home, no matter the temperatures outside. If you don’t take care of the situation on time, they will continue to destroy your possessions and they will mate. ​How long does the insect live? Generally, a carpet beetles’ lifespan is between 9 months and 2 years. This highly depends on the amount of food, the bug consumed, when it was only a larvae. ​Like with every other pest infestation, having carpet beetles running around your home is not the most pleasurable experience. In cases like this, your best option is to hire a professional exterminator. Pest control technicians work with special products and equipment that can put an end to the infestation, without you lifting a finger. Spare yourself the gruesome task and let a professional get rid of the carpet beetles for you.